A&B Mobile Automotive Body Repair has over 25 years in experience with forgian and domestic vehicles. We charge the cheapest prices in town guaranteed! We are mobile, So we come to your work, home of office what ever is suitable for you. or any type of damage? Tired of using your insurance company? 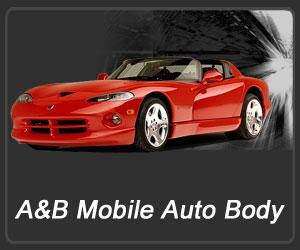 Than call A&B Mobile Auto Body! mobile auto body repair company! No more long waits in body shops. Directly to your home of office. Call today for your estimate.